Before I started Grubarazzi back in September 2011 I had no idea there were so many other chefs and home cooks doing this food blog thang. I thought I would surely post unnoticed, but I did it anyway because I was finally passionate about something. Well, my obsession was set ablaze when I found actual readers and a HUGE food blogging community. Each and every one of you is so kind, thoughtful and supportive. I mean, just look at these awards you have given me during my first year of blogging! I am always impressed by other food bloggers and their supernatural abilities to play with food. So, thank you Beetle Buggy, Curry and Comfort, Cookin’ Cowgirl, and Pinay In Texas Cooking Corner for showering me with reader awards since I started this fun food filled journey. It is my turn to spread the love. My birthday is in 3 days (wooop wooop). I will be 32. Not a day goes by I don’t wonder what the hell happened during the last decade. Time flew by in a frenzy. I hate listening to voice mails. I am currently obsessed with a whole foods approach to eating and cooking. I have not touched sugar, flour or processed food in at least 2 weeks. I feel awesome. I have a mini schnauzer named Austin and a feral cat named Stella. They pretend to hate each other but often share my lap. I smile like a crazy person when I run down hills. I will soon find out if I have a green thumb because I am planting my very first vegetable garden. 320 seeds are nestled happily in little green houses in the sun room. I love putting a handful of fresh mint in my berry protein smoothies every morning. Do it. Sprint 2 The Table – for always inspiring me to get 'r done! Cooking Healthy For Me – for her enthusiasm and delicious food! That Skinny Chick Can Bake – for tempting me on a daily basis! Just One Cookbook – for her beautiful photography! And the blogger community is a wonderful thing I agree! Congratulations on the awards--and it was fun to know more about you! 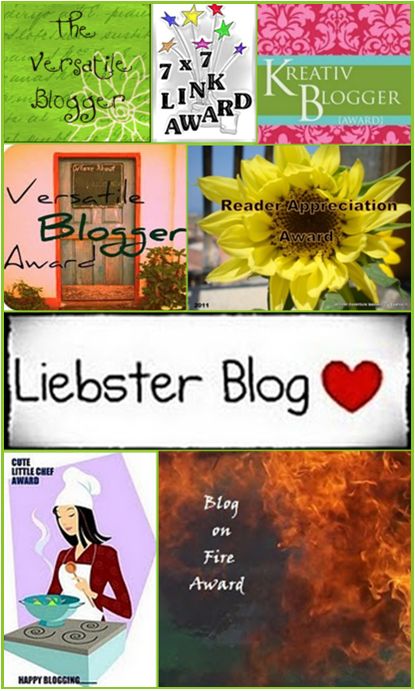 You're one talented and passionate blogger so all those awards are so well deserved! Congratulations and more power! Oh, gosh, you are so sweet! Thank you for ALL these wonderful awards!! !And you probably have the most interesting tidbits about yourself than I've seen posted by anyone in a long time! Early birthday wishes to you, my friend!!! Congratulations on the awards and thank you so much for passing them to me. I feel very honored to receive them from you! And...Happy early Birthday!!! ^_^ Wow your life seems very busy with work, study, and blog! My life is a lot simple just the kids and home, but still I don't know how time passes by so quickly. I really wish I can control my intake on sugar and flour. That's two things that I think I gain weight from. I love carbs and I love sweets (even I don't bake!)... I want to feel awesome without them! You inspired me a bit. We'll see how long I can keep it up. Thanks again, and have a wonderful b-day weekend! Thank you....I am deeply touched! I appreciate it more than you know! Happy Early birthday!